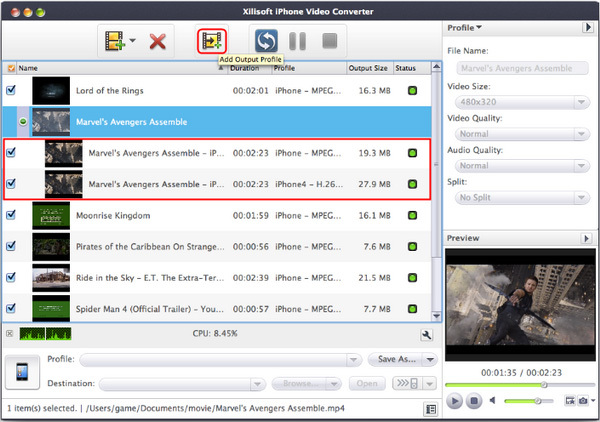 How to convert video files on Mac to make them fit for the iPhone devices you have? 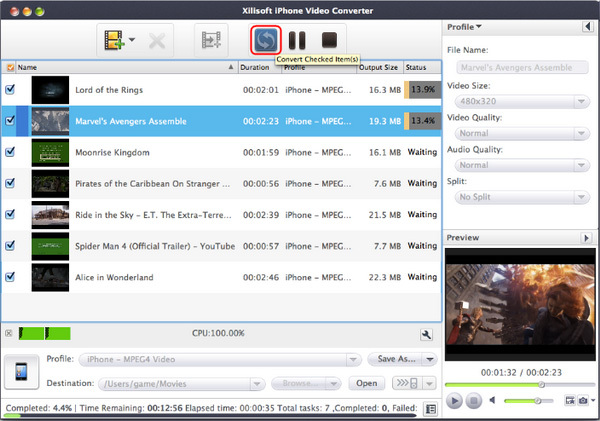 We will now introduce a step-by-step way to complete the task by Xilisoft iPhone Video Convertor for Mac. 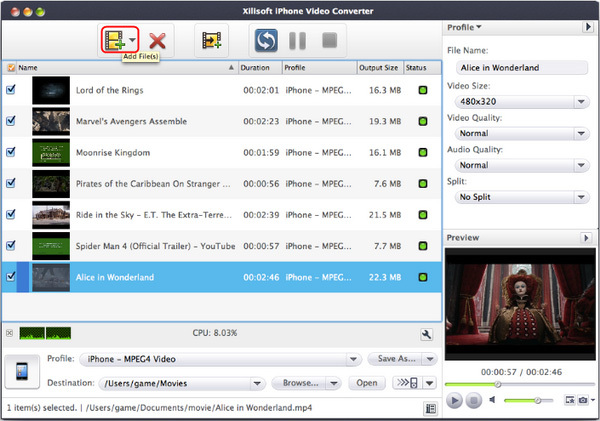 Let's start with the installation of Xilisoft iPhone Video Converter for Mac. Click "Add" button on the toolbar or "File > Add" to load files. Choose the file you want to convert, click "Profile" drop-down button at the right side of the main interface to choose the formats you need, then click "Browse" button to choose destination folder for saving output files. 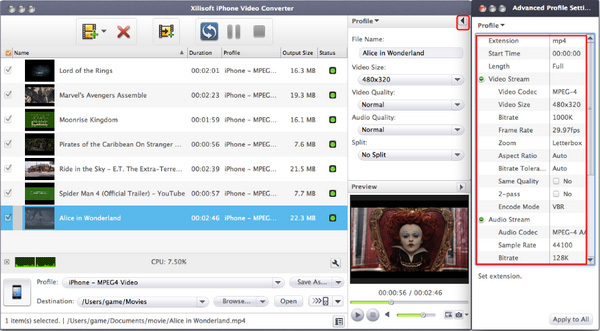 Tip: If you want to do more with your video and audio files, please refer to the "More features". 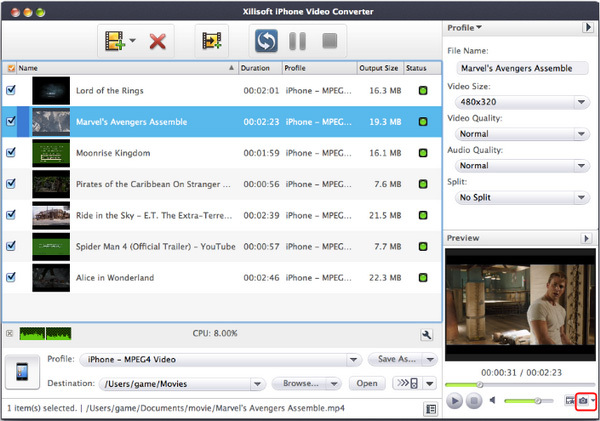 Choose the file and go to "Advanced" button at the right top of the main interface to set detailed parameters for the video as you like. Such as the size, bit rate, aspect, channels, etc. After all the settings of the video, you only need to click "Convert" button on the toolbar to complete the task. You can define the output profile list to show only the most commonly used formats. Click "Custom..." in "Profile" drop-down list, check the formats you want to list in "Profile" pop-up window. Close the window and you will save much time in finding them in the whole list. From one source file, convert several output files with different settings simultaneously; save time and effort! You are capable to make a stylish album using the snapshots taken from the video with this software. Click "Snapshot" button at the right bottom of the main interface to take snapshot when playing the video and save as BMP, click "Open Snapshot Folder" to check the snapshot. 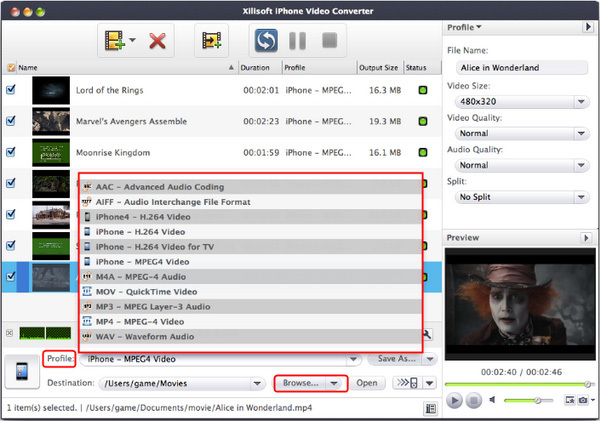 You can also define the destination in your hard disk to save the snapshots at "Snap" tab in "Xilisoft iPhone Video Converter > Preferences". 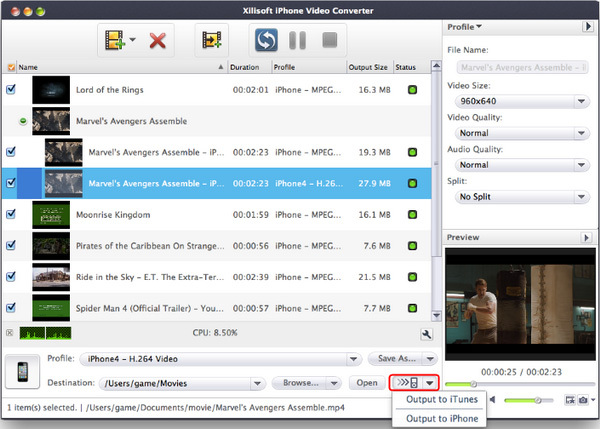 Transfer outputted videos and audios to iPhone directly after conversion to save time. 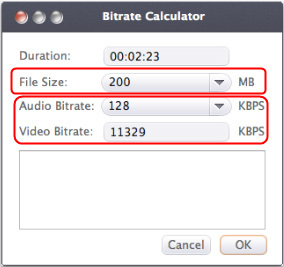 Split one file into several files with preset file size or manually adjust according to your preference by setting it with the bit rate calculator.